Psst, hey buddy. Wanna score some fresh h. pylori? Should we take probiotics, those bacteria pills promising better digestive health, among many, many other uninvestigated claims? Recent articles in the New York Times and The New Yorker (sorry, abstract only) focus on the infant science of the human microbiome, the ecosystems comprised of bacteria, viruses and fungi that live in and on all of us, and, it now seems clear, do more to keep us functioning healthily than ever suspected. There is a ton of promise in this field. For instance, I’ve often wondered why my friends’ kids seem to have so many more ear infections than kids had when I was a kid. And the answer, according to scientists quoted in Michael Specter’s New Yorker piece, seems to be that an over-reliance on antibiotics has gradually, over several generations, eliminated increasing numbers of helpful bacteria in some populations. But it’s not that simple. Don’t buy it. Millions of us wouldn’t be walking around today if it weren’t for antibiotics. They were probably THE major medical advance of last century. The problem is, they helped portray the management of the human microbiome as a fight against good (no bugs) vs. evil (bugs). 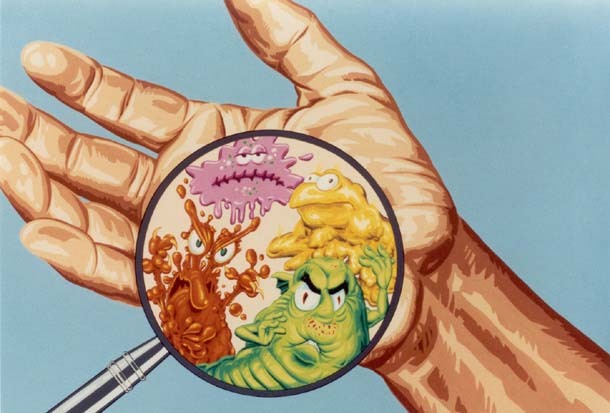 If you kill some bacteria and feel better, killing more bacteria would seem like a good thing. But it’s not. It causes all kinds of problems. But getting rid of antibiotics is not the answer, either. So, what about the other simple conclusion, that more bacteria = good? Again, it’s too simple. The researchers interviewed in the articles referenced above all say the science of the human microbiome is in its infancy. THEY aren’t even close to understanding how all the pieces fit together. So how could the nutrition companies and vitamin sellers pushing probiotic formulas understand the consequences of flooding YOUR unique microbiome with THEIR bacteria? They can’t. They don’t. And they don’t have to. As nutritional supplements, probiotics are not subject to scientific validation. The bug pushers can make any claims they want, as long as they state that the claims haven’t been validated by the FDA. In spite of this, billions of dollars of this stuff is being sold. But the science is far from complete. And for me, there are already a lot of problems with contaminated drugs—how can we be sure “good” bacteria isn’t contaminated with “bad” bacteria? Now, if you’ve already tried probiotics and found they help you, mazel tov. But I’m going to watch and wait. Great things will come from unlocking more of the mysteries of the human microbiome—possibly even treatments for obesity. But it seems to me that the probiotics on pharmacy shelves today are nothing more than a wild crap shoot, albeit a very profitable one.